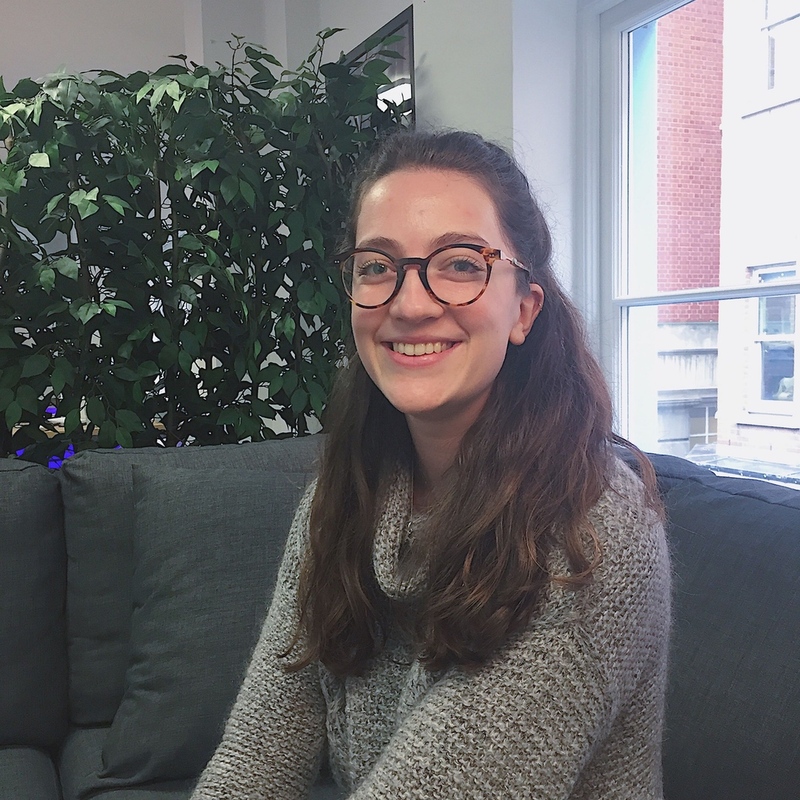 Introducing Hettie Headford, a Graphic Designer at CLICKON London. Here at CLICKON, Hettie switches between coming up with ideas and designing. She helps create ideas that can educate, inspire and tell real stories for clients. First and foremost, when I get into the office at 9 am, my day has to start with a cup of tea. Then I start brainstorming ideas for all the cool brands we work with, like Adidas, Red Bull and the U.S. Navy. I mostly do this is by research and drawing out mind maps, I am quite hands on and I prefer writing things out on paper. Next step is to present our best ideas to the rest of the creative team. Everyone is very encouraging but also honest, so every idea is fully explored and proofed. From there we collectively decide which ideas are best to ditch, or to take further - the best ones are then written up. In between that, and more tea of course, I design logos, pitch decks, or internal things. I am currently in the process of rebranding one of our existing websites. This websites genre is something totally out of my comfort zone. Every day is different, and doing tasks like this allows me to really grow my skill set and knowledge. I love researching, understanding, and empathising with something completely new. This job allows me to use these passions on a daily basis, as I am always coming up with new ideas for campaigns or designs. Our creative team catch-ups are great because I love seeing how different everyone’s ideas are for the same brief. The fact that we are able to listen to everyone, and appreciate everyone’s different interpretation shows just how well we all work together. I love trying out all the possibilities of where a design could go. Job satisfaction is different for everyone, but for me, it really comes down to how well the team works together and being able to see how our initial efforts at briefing stage are transformed into amazing story-led concepts for our clients. What is one of the biggest challenges you face? Being in a creative role is a challenge in itself because not everyone is going to like your ideas, it is very subjective, and you need to learn to take constructive criticism on the chin. Personally, I am working on confidence in my abilities and speaking out about my opinions. This will come with time and experience, as I am still at the beginning of my career and I can only improve from here. When did you decide to pursue a career in the creative industry? My school did not offer Graphic Design, but through other courses, such as ICT and Media Studies, I was able to develop an interest in graphics and my career grew from that. I studied Graphic Design at Falmouth University down in Cornwall where my university was a five-minute walk from the beach. I chose to do Graphic Design as a degree because it’s purely creative, I was able to come up with ideas, design them, and see them through till they became a reality. My degree was very hard and time-consuming, but it was so much fun. The industry involves a lot of hard work and sometimes long hours, but when you enjoy it as much as I do, it is all worth it. Once I graduated, I travelled to Fiji to be a leader for Think Pacific, a charity out there that helps villages and schools on remote islands. I then did some freelance work for Finisterre, a sustainable surf brand, based along the cliffs of Cornwall. After what felt like a lifetime, I got an internship in one of my favourite advertising agencies - Don’t Panic London - and then I progressed to their sister company that focused more on branding and design, Don’t Panic Partners. What is your favourite campaign? I love this campaign because the idea behind it is just so simple, honest and real. Do you have any advice for someone starting out as a graphic designer? Now that I am at the beginning of my career, it has become clear to me that it is okay to not know exactly what you want to do within design, trial and error and experience plays a big part in figuring this out. With experience, it will become clearer what type of creative work you want to do, so take every opportunity you can. Finally, know your worth and stay positive. It is not an easy industry to crack and it can take a long time to get a job. But once you’re in, it is so rewarding and so much fun. So don’t be afraid to ask for feedback, and always doodle your ideas down, however random they are. Download our latest research to read the latest trends and stats you need to know. Including brands that are innovating and tools to help you lead the in-house revolution. ← Can Brands Win Back Consumers Trust? How Did You Hear About Game Of Thrones? CLICKON is a creative marketing partner; built for the new digital era. 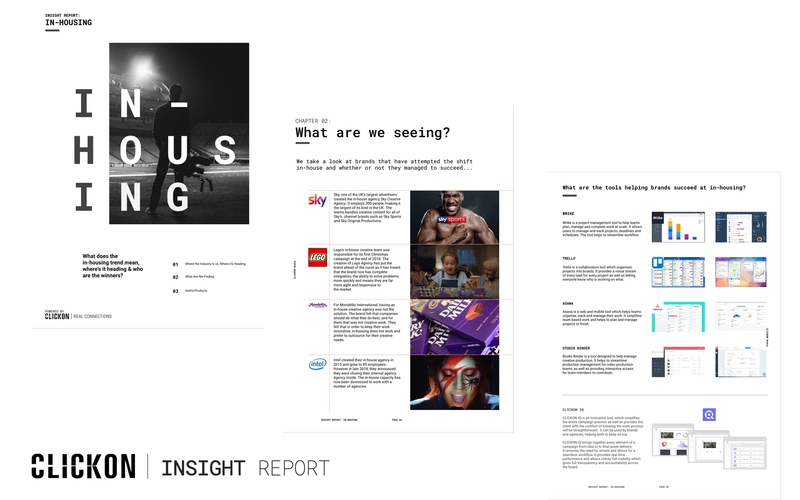 We seamlessly integrate technology with creative, production, data & media to deliver transformational marketing. With over 100+ people spanning offices in London, New York & Los Angeles; we’re trusted by the world's leading agencies, brands and organisations to build real connections with target audiences.